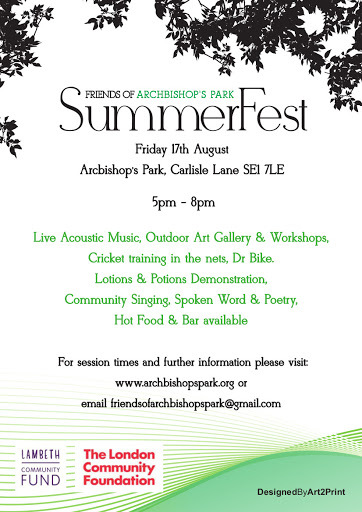 Lambeth Cyclists: Free Dr Bike at SummerFest in Archbishops Park, SE1 Today! Free Dr Bike at SummerFest in Archbishops Park, SE1 Today! 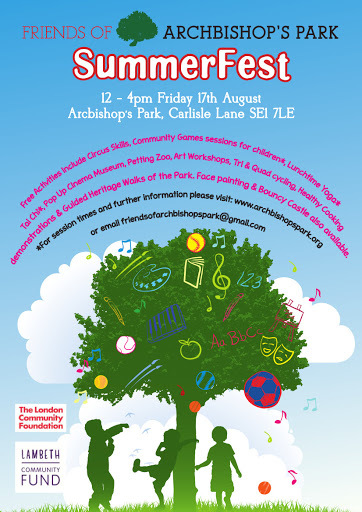 Today, 17 August 2012, come along to SummerFest in Archbishop's Park, Carlisle Lane, SE1 (near Lambeth Bridge) for music, dancing, food and bikes. Have a go on a tricycle with Wheels for Wellbeing (4-6pm), get Dr Bike (4 to 6pm) to fix your bicycle, join in Let’s Get Cooking with Eden Caterers or make an artwork with Block 336. Visit the marquee with the pop up Cinema Museum, afternoon tea and cake then enjoy a Pimms in the evening with acoustic music and a community choir. Hot food 12-8pm,circus, bouncy castle, outdoor gallery, acoustic music and sport for all.